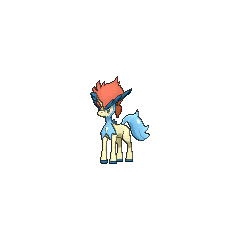 Keldeo in game: 1,306 Who? Important notice! Pokemon Keldeo is a fictional character of humans. Keldeo (Japanese: ????? Keldeo) is a dual-type Water/Fighting Mythical Pokémon introduced in Generation V.
While it is not known to evolve into or from any Pokémon, it has a second form, which is activated by triggering an event in the Pledge Grove, where Cobalion, Virizion, and Terrakion teach it Secret Sword, and it changes its form permanently as long as it knows Secret Sword. Its original form, Ordinary Form, will then become Resolute Form. Keldeo was leaked on a photo of a page from CoroCoro magazine on February 13, 2012, and it was officially revealed on February 15, 2012. Its Resolute Form was officially revealed June 13, 2012. Along with Cobalion, Terrakion, and Virizion, Keldeo is a member of the Swords of Justice. 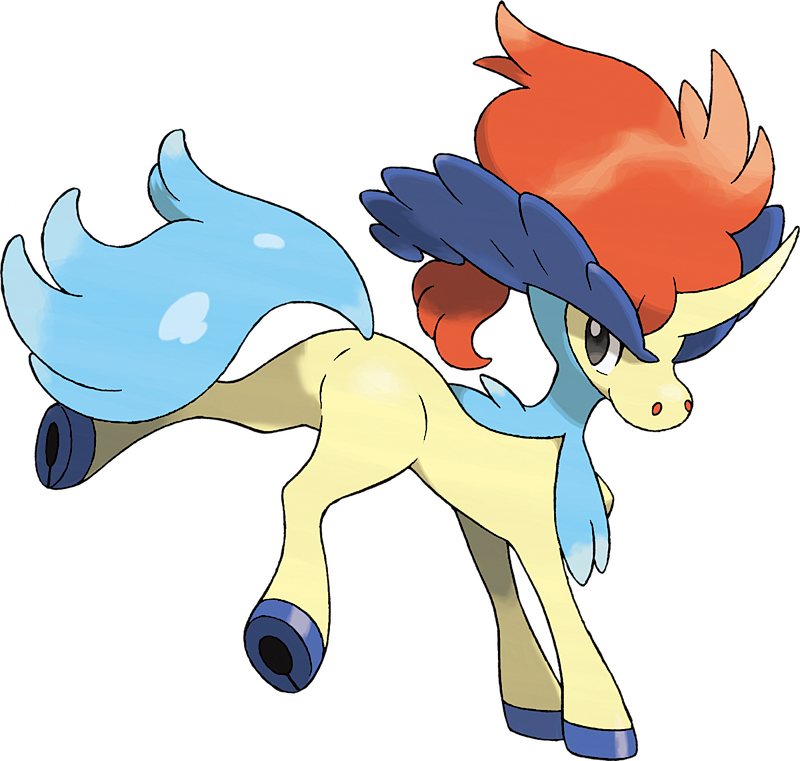 Keldeo is a quadruped, colt-like Pokémon with a cream-colored body. It has a short, rounded snout with large nostrils, and blue eyes. It has a large, feathery red mane, long, dark blue, ridged eyebrow-like protrusions, and a single cream-colored horn that curves slightly. The back of its head, as well as its neck, is covered with fluffy, light blue fur. Keldeo has blue hooves, which are capable of ejecting water. Its tail is light blue with white spots and resembles an elaborate feather in a cap. Upon learning Secret Sword in Pledge Grove, Keldeo transforms into its Resolute Forme. The dark blue protrusions become shorter and lighter in color, resembling ears. Its horn becomes dark blue, and grows larger and ridged. On the side of its head are three feathers colored aqua blue, green and orange. Keldeo tends to cross the world, and often appears at beautiful watersides. It can walk across water by ejecting water from its hooves. 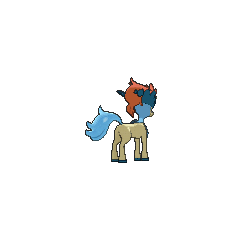 It is thought that when Keldeo becomes resolute, its body fills with power and it becomes swifter. Long ago, a fire started in the Moor of Icirrus because of a war among people. In this fire, Keldeo was separated from its parents, but together, Cobalion, Terrakion, and Virizion took care of Keldeo. They acted as its parents, and they taught it knowledge and moves for survival. Keldeo eventually grew and even surpassed the three Pokémon. One day, Keldeo took off from the forest with no one knowing why. When the four meet again, they teach Keldeo the move Secret Sword. Keldeo made its debut in the fifteenth Pokémon movie Kyurem VS. The Sword of Justice, being one of its stars along with Cobalion, Terrakion, Virizion and Kyurem. In the film, it was training to learn how to use Sacred Sword so it could become one of the Swords of Justice, but arrogantly picked a fight with Kyurem before it had learned the move. Keldeo becomes terrified and flees during the middle of the fight, but is pursued relentlessly by Kyurem, who is determined to finish their battle. Along with the Legendary Pokémon present in the movie, Keldeo can speak through telepathy. Keldeo appeared in Kyurem VS. The Sword of Justice. Keldeo makes its first formal appearance at the Pledge Grove, where it awaited Cobalion, Terrakion and Virizion to arrive and teach it Sacred Sword. After acquiring the move, Keldeo follows its mentors to where they would confront the Shadow Triad who tried to capture the trio earlier, which was near the P2 Laboratory. There, the Shadow Triad are locked in combat with Cilan, Chili and Cress, the Striaton Gym Leaders. From the expressions on each sides' Pokémon, Keldeo determines the Striaton Gym Leaders to be the good side. Keldeo rushes in to defeat the Shadow Triad's Pokémon, but gets captured in the process. Fortunately, Cobalion, Terrakion and Virizion come to the rescue by swinging their swords at both trios, defeating both sides before deciding to leave. Although defeated, the Shadow Triad refuse to back down and activate the P2 Lab's doors and have their secret weapon fire a laser at Keldeo. Keldeo is protected by its mentors, who are frozen by the laser and proceed to sink into the waters below. Two years later, Keldeo was encountered by Blake and Whitley during a run to fill the Pokédex with data. After having been lured out by Whitley's Foongy's Sweet Scent, Keldeo lashed out at the two and attacked them with its sword. Blake managed to dodge, but accidentally stepped too far and fell down a cliff. Shortly afterwards, Blake caught Keldeo. 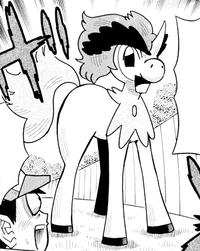 A Keldeo appears in PMBW30 of Pocket Monsters BW. Keldeo in Super Smash Bros. for 3DS. Keldeo using Secret Sword in Super Smash Bros. for 3DS. Resolute Form Keldeo appears as a Poké Ball summon in both the 3DS and Wii U versions of the game. It will slash opponents with Secret Sword. NA: This Water/Fighting-type Pokémon is a lot like a multicolored unicorn. In its Resolute Form, its horn will grow longer and its vision is keener. 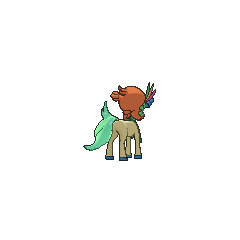 It is this Form that appears on the battlefields of Smash Bros. Be wary of its Secret Sword attack—Keldeo's charge will send anyone hit flying. PAL: The Mythical Pokémon Keldeo looks a lot like a multicoloured unicorn. In its Resolute form, its horn grows longer and its vision improves. It can also use Secret Sword in that Form, and that's what it will do in this game. If Keldeo starts charging after you, watch out - that huge horn will send you flying! Pokémon Mystery Dungeon: Gates to Infinity: Keldeo is an important character in the storyline. Moves marked with a superscript game abbreviation can only be bred onto Keldeo in that game. 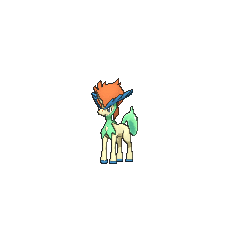 For other sprites and images, please see Keldeo images on the Bulbagarden Archives. Unlike the others, Keldeo is unable to learn Quick Attack. Instead, it is capable of learning Aqua Jet, a variation of Quick Attack. 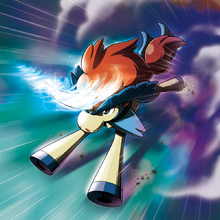 The moves that Keldeo learns by level have higher base powers than the moves learned by the other Swords of Justice. Keldeo learns Sacred Sword later than the others. Its legs seem to be stylized after animal legs and hooves, unlike the others, which seem to have boots. Keldeo isn't listed near the other three in National Pokédex order. Keldeo's name doesn't end with -ion. Keldeo, along with Meloetta, are the only Mythical Pokémon to learn their signature moves from an external source. Keldeo has the lowest base stat total of all Mythical Pokémon, excluding Phione, whose Mythical status is disputed. Its trait of running across water mirrors Suicune, another quadrupedal Water-type Pokémon. Due to Keldeo not being legitimately available in Pokémon Black and White outside of events, the Legendary Pokémon battle theme and the Swords of Justice intro can only play when Keldeo is battled in-game via cheating. Keldeo is the lightest and smallest of the Swords of Justice. Keldeo is most likely based on the legend of the kelpie, a supernatural water horse that sometimes appeared as a lost pony. 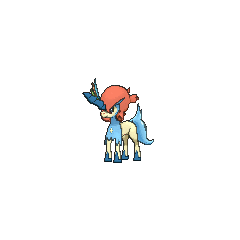 Keldeo is also likely based on the kirin also referred to as the "Chinese unicorn" which are often depicted with a single backwards curving horn and possess the ability to walk on water. Keldeo also draws inspiration from the character of d'Artagnan from the novel The Three Musketeers. Like d'Artagnan, it is the latest and youngest addition to the group. Keldeo's tail also resembles d'Artagnan's trademark feathered cap. 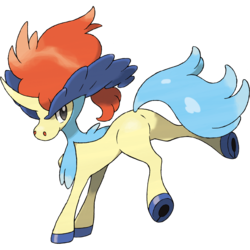 Keldeo may be derived from kelda (Old Norse for spring/fountain) or may be a combination of kelpie, (a water horse from Celtic folklore) and rodeo (a sport involving skills with horses, cows, and other livestock).